Dinnerware with classic French style for relaxed elegance. Earthenware dinnerware. Hand-painted finish. Microwave and dishwasher safe. Handcrafted 12-piece Arabesque dinnerware service in pink. Four each of 11.3"Dia. dinner plates, 9.1"Dia. salad plates, and 5.3"Dia. soup/cereal bowls. Earthenware. Made in Portugal. Raised design. Made of ceramic. Antique-white finish. Dishwasher safe. Display good taste at your table with this romantic dinnerware An elegant white-on-white dinnerware pattern featuring an embossed vine motif and interior glaze, the Opal Innocence Carved collection of dinnerware and dishes gets your table set for refined dining every day Ceramic with antiqued cast-aluminum accents. All pieces are handmade and finish will vary slightly. Ceramic pieces are dishwasher safe. Set your table with the elegant Classic Touch Trophy Gold Collection dinnerware set. Elevate your tablescape to a new level of luxury. 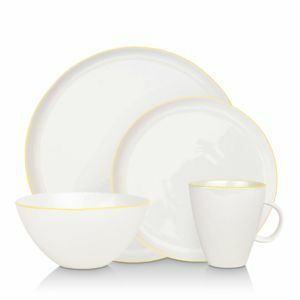 Upgrade to a totally new look with this alabaster white dinnerware set, finished with gold rim This elegant fine china collection from Marchesa by Lenox is embellished with navy banding and raised enamel dots, and finished with gleaming platinum Elevate any meal with the understated elegance of this Baroque dinnerware set from Martha Stewart Collection. Gold-tone trim accents porcelain scallops, creating sophisticated style that blends perfectly with a range of table linens. Handcrafted glass dinnerware. 24-karat gold painted by hand. Four-piece sets. 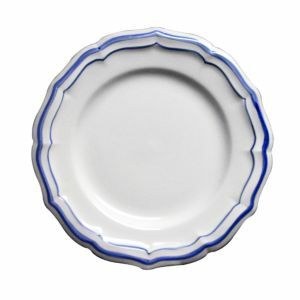 Porcelain dinner plate and dessert plates. Dishwasher and microwave safe. Made in France. Porcelain dinner plate and dessert plates. Dishwasher and microwave safe. Made in France. Porcelain dinner plate and dessert plates. Dishwasher and microwave safe. Made in France. Porcelain dinner plate and dessert plates. Dishwasher and microwave safe. Made in France. Porcelain dessert plate with flowers. 24-karat gold details. 8.7"Dia. Dishwasher safe. Made in France. Handcrafted basketweave dinnerware. Service for four. Hand-glazed earthenware. Hand-applied goldtone trim. Hand wash. Made in Portugal. Handcrafted dinnerware. Bone china. Dishwasher, microwave, and oven safe. Handcrafted dinnerware. Earthenware. Dishwasher and microwave safe. Classically stylized with concentric rings in white this design serves as a blank canvas for all your meals you can create. A soft pink reactive glaze with a darker details on salad plates and mugs brings casual sophistication to this Laurie Gates Matisse Pink 16-piece stoneware dinnerware set from Gibson. Embossed with concentric flair, Gibson's Plaza Cafe White dinnerware set brings fresh dimension to casual dining in versatile stoneware. Thoroughly charming in their simplicity, this hand-glazed porcelain canvas collection named for the French district Abbesses features organic shapes highlighted with hand-painted rims. Unique geometric shapes and clean design give this fine china white dinnerware and dishes collection from Mikasa a modern sensibility. The fact that it's microwave and dishwasher safe makes it perfect for everyday use Thoroughly charming in their simplicity, this hand-glazed porcelain canvas collection named for the French district Abbesses features organic shapes highlighted with hand-painted rims. A vintage charmer, French Perle Bead dinnerware is shaped by delicate beading and scalloped accents in durable stoneware. 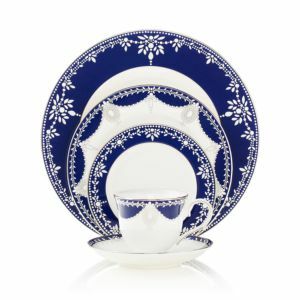 Tea-stained edges add to the old-fashioned sensibility of a most-graceful Lenox collection The mesmerizing icy blue hue of Lenox's French Perle 4-piece place setting adds a standout look to your tabletop. The unique shape and delicate rimmed border of each piece punctuate the collection's sophisticated style. 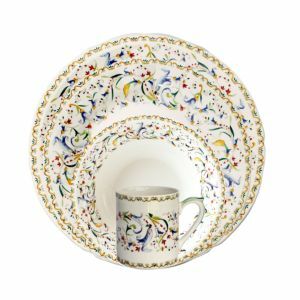 With fanciful beading and a feminine edge, French Perle dinnerware from Lenox has an irresistibly old-fashioned sensibility. Hardwearing stoneware is dishwasher safe and, in an ethereal hue with antiqued trim, a graceful addition to everyday dining. 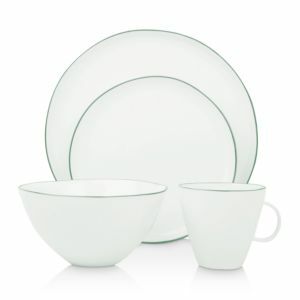 For nearly 150 years, Lenox has been renowned throughout the world as a premier designer and manufacturer of fine china. A mix of botanical and lattice motifs bordering the smooth and scalloped rims of the Chelse Muse Dinnerware Collection by Lenox are made all the more prominent by a glossy reactive glaze to present a sophisticated look that can lend even the most dour of dining spaces a bold touch of sophistication and regal refinement. A mix of botanical and lattice motifs bordering the smooth and scalloped rims of the Chelse Muse Dinnerware Collection by Lenox are made all the more prominent by a glossy reactive glaze to present a sophisticated look that can lend even the most dour of dining spaces a bold touch of sophistication and regal refinement. A mix of botanical and lattice motifs bordering the smooth and scalloped rims of the Chelse Muse Dinnerware Collection by Lenox are made all the more prominent by a glossy reactive glaze to present a sophisticated look that can lend even the most dour of dining spaces a bold touch of sophistication and regal refinement. Graceful curves on the outer rims and inner band edges frame the elegantly embossed lacy motifs of the Lenox Chelse Muse Scallop ironstone dinnerware collection that's finely finished with a reactive glaze. Bold golden splashes on white bone china bring modern elegance to a table set with the Lenox Casual Radiance dinnerware collection. Delicate curves outlined with embossed vine motifs are accented by dainty blooms in the Lenox Chelse Muse Flower ironstone dinnerware collection that's finely finished with a reactive glaze. The Solitaire pattern from Lenox's dinnerware and dishes collection expresses timeless refinement in the simplicity of translucent ivory bone china banded in polished platinum. Handcrafted by Lenox since 1915, the Westchester dinnerware collection reflects an era of opulent fine dining in elegant bone china. A lustrous ivory hue and bands of etched gold bring old-world grandeur to today's formal settings. Forever elegant, the Eternal dinnerware collection from Lenox accents the table in timeless ivory-toned bone china with sumptuous gold banding. Coordinates with Eternal Gold stemware.